There were some fantastic songs released in 1983 - you can see my favourites here - but the single that ended up as the year's biggest hit in Australia wasn't a song at all. Outperforming the likes of "Gloria", "Billie Jean" and "Total Eclipse Of The Heart", the number 1 single of 1983 in Australia was a pun-packed spoken-word record by a stand-up comic who'd started performing just two years earlier. The song that ended the year as Australia's second biggest single was still at number 1 this week in 1983. "Flashdance... What A Feeling" by Irene Cara stayed on top for a third week. This was the astonishing debut single by British new wave band The Europeans, who are not to be confused with Europeans, a late '70s band from the UK with just as limited success. The third and final single from Lionel Richie's self-titled debut album was another US top 5 hit, but the "Easy" soundalike, which features Kenny Rogers on backing vocals, barely dented the Australian top 100. Unlike Lionel, fellow soul/R&B singer Al Jarreau only reached the ARIA top 100 twice - once with this track from his Jarreau album and again in 1987 with the theme to Moonlighting. Chris De Burgh had visited the Australian top 5 earlier in the year with "Don't Pay The Ferryman" but found the waters less welcoming with his next nautically themed release. Between their 1964 debut with "You Really Got Me" (an Australian number 8 hit) and 1970's "Apeman" (which reached number 5 here in early 1971), The Kinks had enjoyed a string of 11 top 50 hits locally. Despite continuing to record throughout the '70s and early '80s, nothing the band released during that time had troubled the chart. This single, which had originally flopped in the UK in November 1982, might not have charted in Australia either had it not unexpectedly become a top 10 hit in the US in mid-1983. A return to The Kinks' earlier sound, "Come Dancing" was written by Ray Davies as a tribute to his sister Rene, who'd died from a heart attack at a dance hall in the late 1950s. It'd be the band's final ARIA chart appearance. They'd enjoyed a flawless start on the Australian charts - with two number 1 albums and five consecutive top 10 singles - but Men At Work's dream run came to an end with the unfortunately titled "It's A Mistake". Interestingly, the song, which is about the Cold War potentially leading to nuclear warfare, received a much warmer reception in the US, where it peaked at number 6. Men At Work would be back in the Australian top 10 later in 1983 - but with one of their previous hits. Here's another band who usually performed better on the Australian chart - well, at least they had in the late '70s when they notched up seven top 40 hits. But, it had been three-and-a-half years since they had a number 1 single with "Please Don't Go" and this track from All In A Night's Work was hardly their best effort. In fact, I'm puzzled why "(You Said) You'd Gimme Some More" was even released at this point when they had a much better song waiting in the wings - a song we'll see restore the disco/funk group to the top 5 in the coming months. Not all previously successful bands were having a tough time of it on the Australian chart in 1983. Even though band members were starting to abandon ship, ELO landed what would be their last big hit with this lead single from the ambitious Secret Messages album. As its title suggests, "Rock 'N' Roll Is King" eschewed some of the more modern sounds the band had experimented with on previous releases for a straightforward rock feel, complete with a surf guitar intro, a boogie woogie piano and that "whamalamabamalama" lyric. The throwback track would give ELO one last hurrah on the Australian singles chart, with only one minor top 50 entry to follow. There was nothing novel about novelty records in 1983. Australia had even had a chart-topping comedy single as recently as the summer of 1980/81 when "Shaddap You Face" stayed at number 1 for eight long weeks for Joe Dolce Music Theatre. But there was something about the debut single from stand-up comedian Austen Tayshus (real name: Alexander "Sandy" Gutman) that really appealed to the Australian public. Written by Billy Birmingham, who'd become quite familiar with number 1 singles and albums in his guise as The Twelfth Man, "Australiana" took the form of a story incorporating a series of plays on words. Words like kookaburra, platypus, waratah, Nullarbor, Great Barrier Reef, Eureka Stockade and Vegemite - all true blue stuff. The puns came at a fast and furious pace, and it's interesting listening to the live audience on the record - there's everything from appreciative laughter to groans at the more on-the-nose gags to delayed reactions when it takes a second or two for the cleverer jokes to sink in. I remember my eight-year-old self being amused by "Australiana" at the time. A lot of the more adult material went straight over my head, but it was a clever routine that actually did stand up to repeated listens. And so, people went out and bought the 12" single (the only format it was available on) in droves, and listened to it over and over again. Then quoted it to each other. 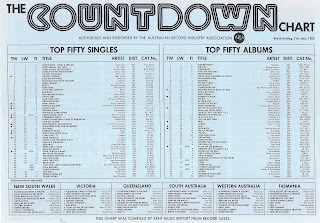 "Australiana" spent eight non-consecutive weeks at number 1 in Australia - its run at the top interrupted due to it being banned for a week in Victoria (on account of B-side "The Comedy Commando") and dipping down to number 7 for that week. 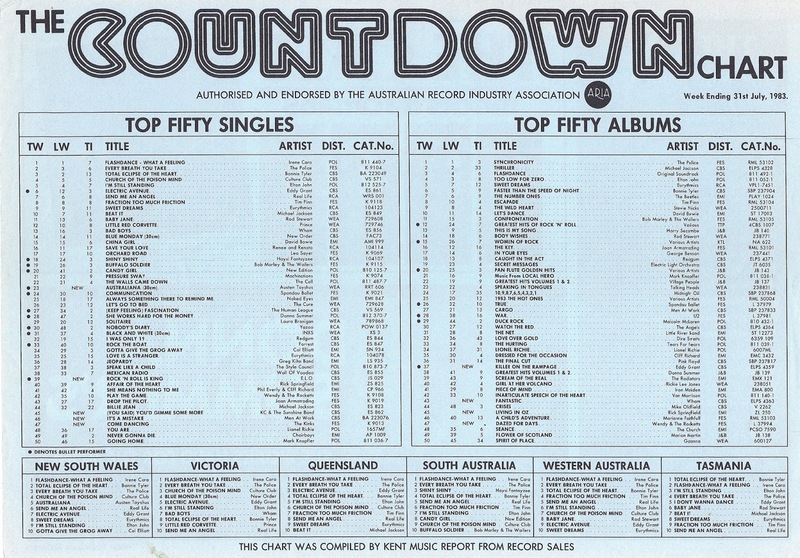 The record ended 1983 as Australia's top single, but like all year-end charts before 1988, that's based on an aggregate of chart positions rather than sales. 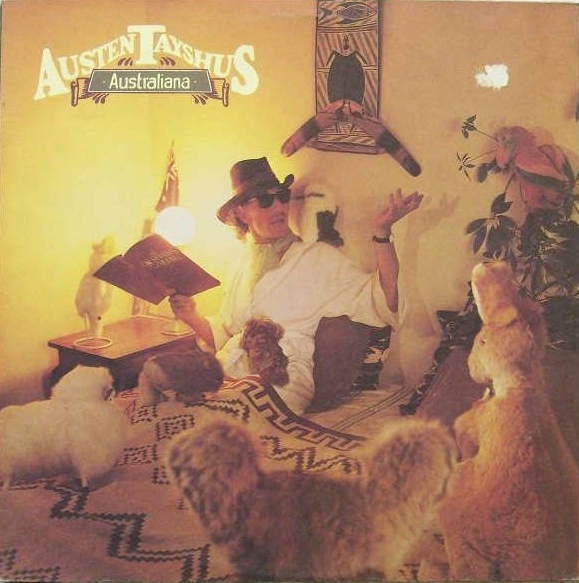 Nevertheless, "Australiana" is regularly cited as the best-selling Australian single of the '80s and even of all time. With reported sales of over 200,000 copies, "Australiana" was likely the highest-selling single by an Australian artist during the '80s, with "Locomotion" by Kylie Minogue its closest rival. Whether or not international hits like "We Are The World" or "Never Gonna Give You Up" outsold "Australiana" is unclear. Outside the '80s, many singles by local and international acts have outsold "Australiana", with the highest-selling single of all time in Australia still Elton John's 14 times platinum "Candle In The Wind '97/Something In The Way You Look Tonight". Next week: the second big solo hit by a member of one of the top-selling bands of the 1970s, plus another hugely successful artist from the '70s scores his biggest single. 'It's a Mistake' is a wonderfully ironic title for your first flop single. Until I'd seen a video of theirs, I thought KC was black. I actually wasn't familiar with 'Australiana' until the Presets chose the video for their rage guest programming in 2008. I was shocked that it wasn't actually a song. To be honest I find the 'jokes' quite lame, and like all spoken-word comedy records, I'm not sure why people would want to listen to it more than 2 or 3 times. It's a shame we'll probably never know what was actually the highest selling single of the 80's in Australia. I always thought 'Locomotion' was mistakenly labelled as such because it was the highest-selling single in Australia *by an Australian artist* during the 80's (if that's the case), and that Rick Astley outsold her. But who knows. I think David Kent had ‘(I’ve Had) The Time of My Life’ as the #1 single of the 80s in his top 20 chart book from 2006; but the top 20 otherwise looked rather suss (i.e. containing numerous #2 singles, ‘Love Shack’ [which was only #1 over Xmas ’89], and maybe even a #3 single from memory). I've seen reports for both Australiana and Locomotion as the highest selling "Australian" single of the 80s - but a lot more for the former. Either of them could easily be the overall highest selling single (Australian or international) since they were at number 1 for a long time. But then, it could really be any number of songs since we don't have year-end sales charts for the decade. David Kent sent me a Top 1000 of the 80s document a while back, which has his rankings of the top 500 singles and top 500 albums for the decade. Never Gonna Give You Up is number 1 in the decade for that, but it's definitely based on the points system for chart positions (and Dancing In The Dark is number 2). I tried to find out if an overall sales list for the decade existed, but he didn't have that info. My father had 'Australiana' on vinyl and I have very vague memories of one or two of the jokes from that routine. Definitely gonna have to check this out again. Comedy routines as chart entries only seem to have been a thing for a handful of years in the 1980s. Australiana was not played on the radio, yet bits of it went round by high school as running jokes, so I'll be blowed if I could work out how you could have listened to it in those days well before the internet made looking stuff up just a click away! Of the other new songs, Come Dancing is a wonderful song - one of the best ones by Kinks main man Ray Davies. Rock And Roll Is King is an ELO song that I remember better as having being performed by the Young Talent Team on TV more than the original version!